No matter by what name you might know it, the principle is the same. CLF (carbon laser facial) is a non-ablative laser skin treatment that uses the conductive qualities of carbon to quickly and painlessly exfoliate, cleanse, clear and tighten pores, brighten and even-out skin tone and activate a deeply rejuvenating skin reaction that produces skin that is smooth, plump and radiant! A carbon paste, cream or lotion is applied to clean skin in a very thin opaque layer and allowed to reach skin temperature approximately for 10 to 20 minutes. As the carbon dries, it is attaching to dirt, oil or dead skin cells on the surface of the skin. The carbon is now ready to meet the laser. Light from the laser is attracted to the carbon. The carbon absorbs the light energy. The reaction causes a mini explosion. The explosion pushes the energy, in the form of heat, deep into the layers of the skin where elastin and collagen are activated and cells begin producing anew. Meanwhile, on the surface of the skin, as the explosion occurs the carbon is vaporized along with any dirt, oil or dead skin cells. Sounds kind of scary, with all the explosions and vaporizing, but don't worry. There's very little discomfort or pain. The sensation has been described as a mild tingling or very slight pinch. At the end of the treatment the skin will feel slightly warm. Skin is plump and “baby-bottom” smooth. There’s a more even tone. Fine lines are diminished. Pores are tighter. These outcomes are realized almost immediately, and will last for several days. The heat energy introduced through the explosion is the reason why skin looks and feels plump and tighter, and that fine lines are noticeably diminished. As the heat is pulsed deep into the skin, the skin’s natural healing mechanisms are activated in the deeper layers of the skin. Cellular turnover is stimulated. Fibroblasts are ignited to begin regenerating collage and elastin. Over a few weeks to months, the regenerative results will continue. 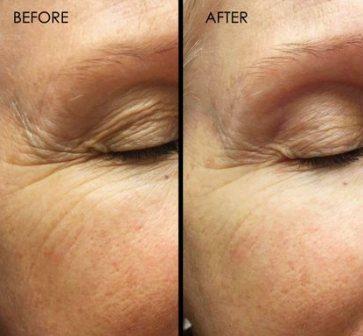 For longer term change in the tone, firmness and radiance of the skin, multiple treatments are recommended. If “some is good, more is better” resonates with you, it is true for carbon laser facial treatments. CLF is great for a one-time feel good, pick-me up, or before an evening out, or even something to do monthly for improving and sustaining the quality of your skin. Each treatment builds upon the previous one. Once the regeneration of cell turnover is started, the best way to keep making improvement to the skin is to commit to a series. Three to five treatments over a period of 2 to 3 months with a booster treatment every six months is recommended for the best results. There is little to no time needed for recovery after the treatment. In some rare instances itching, flaking and rashes might develop; most usually resolves in a few days. Moderate aftercare includes using sun protection (SPF 50 or greater), avoiding hot water, swimming and hot tubs. Makeup can be applied in just a matter of a few hours after the treatment. Incidentally, CLF is becoming a go-to skin treatment by many brides-to-be looking at affordable and effective ways to get their most beautiful skin in time for their special day. For a very special event, like a wedding, it is recommended that treatments be completed a week pre-event to allow for the regenerative benefits of the skin to emerge. Three treatments will offer you the best results. Get three for $850 or $300 each. CLF is a practical, affordable way to make your skin look radiant! Get three for $850 or $300 each. It’s not surprising that celebrities and Hollywood personalities have been associated with treatments like the Carbon laser facial before a special event or as part of their regular skin care regimen because they know how amazing their skin looks and feels. Realistically, few of us has much in common with folks in Hollywood, but with the Carbon Laser Facial treatment, we can get the same beauty benefits of plump, smooth, radiant skin!